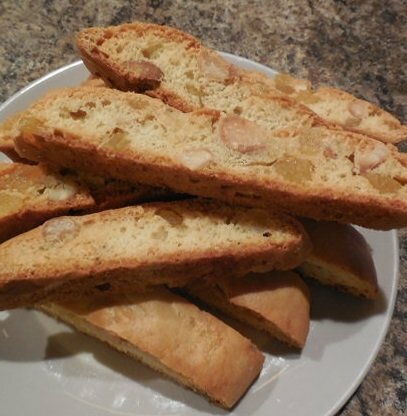 Here at Italian Christmas Baking Recipes you will find a nice selection of traditional Italian Baked goods, including a holiday biscotti recipe. Included are some of the most traditional Italian Christmas cookies that Italian Nonne... or Grandmothers have preserved for many generations. Browse the Italian Christmas Baking Recipes recipes below and you will find recipes you can use for your Christmas celebration. For sure all these recipes can also be used for your New Year's Eve and New Year's Day celebrations as well! 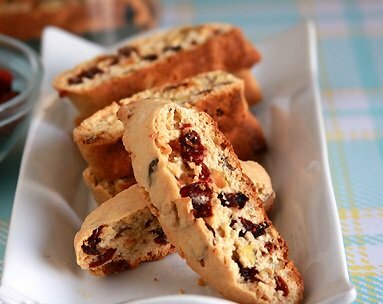 These Holiday Biscotti are pleasingly chewy biscotti, coated on one end or drizzled with white chocolate and sprinkled with colored sugar crystals. I make these every year; they travel extremely well and make a great Holiday gifts. Sift flour, salt and baking powder into a medium bowl. In a separate, beat butter and sugar until blend well, using an electric mixer. Beat in eggs 1 at a time. Mix in lemon peel, vanilla, and anise. Add n flour mixture and mix just until blended. Stir in cranberries and pistachios (dough will be sticky). Turn dough out onto lightly floured surface and knead until dough comes together. Gather dough together; divide in half. Roll each half into 12 to 15 inch-long log (about 1 1/4 inches wide). Carefully transfer logs to 1 prepared baking sheet, spacing 3 inches apart and flatten a bit. Bake logs until almost firm to touch but still pale, about 28 minutes. Cool logs on baking sheet 10 minutes. Maintain oven temperature. Carefully transfer logs still to cutting board. Using serrated knife and gentle sawing motion, cut logs crosswise into generous 1/2-inch-thick slices. Place slices, 1 cut side down, back on to the baking sheet. Return to oven and bake until firm and pale golden, about 9 minutes per side. Transfer cookies to racks and cool. Stir white chocolate in top of double boiler over barely simmering water just until smooth. 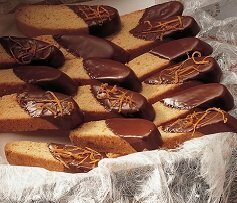 Remove from over water, place in Ziploc bag, nip corner off and drizzle over biscotti. Sprinkle with red and green sugar crystals. Place cookies on prepared sheet. Chill until chocolate is firm, about 30 minutes. Store airtight between sheets of waxed paper at room temperature. Almond Ravioli... delicate cookies filled with Almond Paste! They are a delightfull addition to the Christmas Baking Recipes Collection. Mix the almond paste, the egg whites and the sugars together. At the end fold in the chocolate chips. In a bowl, mix all the dough ingredients and add as much milk as necessary to make the dough soft and elastic. Cover it and let it rest for 30 mins. Take a small ball of dough the size of a golf ball and roll it in your hand. With your finger, press and indentation into the dough and fill it with the filling. Close cover the filling with the dough on the sides of the ball and roll it again in your hands. Place it on a baking sheet and with the palm of your hand press it down. Make all your cookies and bake them at 375F for about 10 Min. 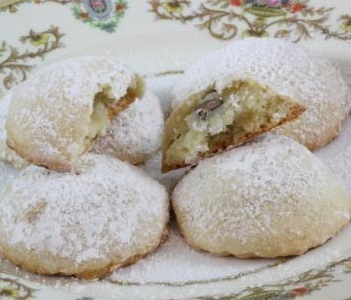 These Almond Biscottini... are so delicate and delicious! My mom has a great collection of Christmas Baking Recipes, these remind me of the Almond Crescents she use to make at Christmas time. Well, accept for the sugar sprinkles! Line a baking sheet with parchment paper or silicon baking pad and set aside. Put the chopped almonds in a bowl; add the lemon zest, the sugar and egg whites. Mix until the egg whites dilute the sugar and the mixture becomes a paste. Take a lump of dough; roll it into a stick about 8" long and 1/2" thick. Press with a fork to flatten it and create ridges with the teeth of the fork. Cut the strip of dough on a diagonal with a knife, pieces should be about 1 1/2" long. Place all the cookies on a baking sheet and bake for 8-10 minutes at 350F. Remove from oven and let them cool. Meanwhile prepare the icing. Place on waxed paper and let the icing dry completely for several hours. * you can use blanched almond meal to save time. 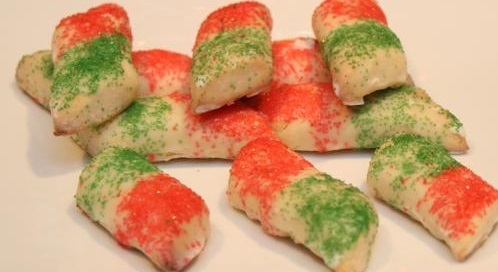 These scrumptious Christmas Cuccias are an Italian family tradition during the Holidays. The filling is basically a mixture of dried figs, raisins, walnuts, candied orange rind and spices. You can enjoy them with a cup of espresso, plain coffee or just a simple glass of milk. Beat together butter and sugar in a large bowl with an electric mixer at medium-high speed until pale and fluffy, about 3 minutes in a standing mixer (preferably fitted with paddle attachment) or 6 with a handheld. Beat in egg and vanilla. Gather up dough on a sheet of plastic wrap and roll up dough in plastic wrap. Chill dough in refrigerator l firm, at least 4 hours. In the mean time prepare the filling. Place the dried fruits and nuts and spices in a food processor and blend until thick dough like paste forms. Add a little warn water if necessary. Cut dough in circles 4 inches in diameter. An old can from 28 oz. tomatoes is just the right size. Roll filling in walnut-size balls, place in center of cut dough fold over. Press edge with wide tined fork before baking. Cool on sheets 3 minutes, and then transfer to racks to cool completely. Prepare Icing by blending the milk and powdered sugar. Brush each cookie and sprinkle with sugar crystals. Plane on waxed paper and allow to hardened before storing in air tight container. Chestnut Tortelli are a traditional Italian Christmas dessert. 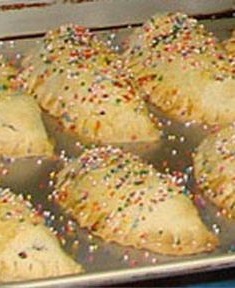 They are made with a pastry dough that is filled with a mixture of ground chestnuts, rum, cinnamon,and chocolate. Some bakers fry rather than bake these cookies. They can also be drizzled with honey or rolled in cinnamon-sugar. In Calabria and other parts of southern Italy, cooked chickpeas are substituted for the chestnuts. 3/4 cup chopped semisweet chocolate or mini chocolate chips. Combine the flour, baking powder, and salt in a food processor. Add the butter and pulse the mixture until coarse crumbs form. In a small bowl, whisk together the eggs, oil, and water. Add to the flour mixture and pulse until adough starts to form. Remove the dough, shape into a disk, and wrap in plastic wrap. Let rest for 30 minutes. The dough can also be refrigerated for up to 48 hours. Combine the chestnuts, sugar, cocoa, and rum, and cinnamon in a food processor. Process until finely chopped and transfer to a bowl. Divide the dough into 4 pieces. Roll out each piece about 1/8-inch thick. With a biscuit cutter, cut out 2-1/2 inch rounds. Place a teaspoon of the filling on one half of each round.Moisten the edge of the round with a little water, fold the round in half and pinch the edges to seal. Place the tortelli on the baking sheets. Bake 15 minutes or until lightly browned and crisp. As the tortelli come out ofthe oven, transfer them to a bowl filled with the confectioner's sugar. Roll them in the sugar and then transfer to wire racks to cool. 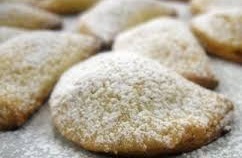 If you have a great Recipe for Italian Christmas cookies, why not add it to our Christmas Baking Recipes Collection. 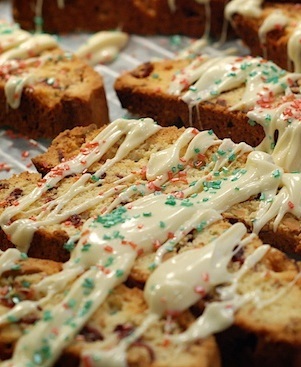 If you have a question or comment about or Italian Christmas Baking Recipes, ASK AWAY!